Bank Cottage in Bowness-on-Solway, near Wigton, Cumbria sleeps 4 people. Bank Cottage near Wigton is a little hidden gem! Bank Cottage is tucked away off the main street in a small friendly village within the Solway Coast Area of Outstanding Natural Beauty. This detached 18th-century cottage has been completely renovated to a high standard, balancing style and comfort in equal measure. 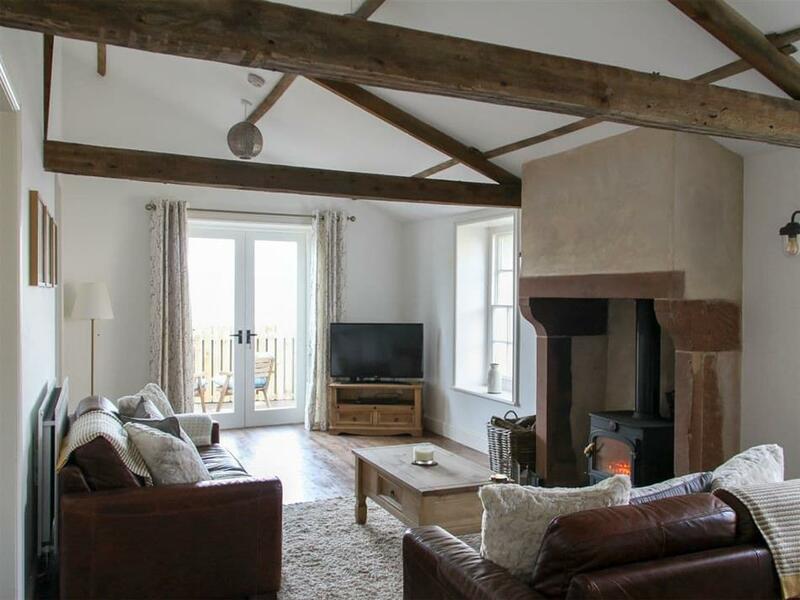 It is cosy and comfortable with a large wood burner in the living room, luxury bathroom, sumptuous bedrooms and the most stunning views over the Solway Estuary towards Scotland. 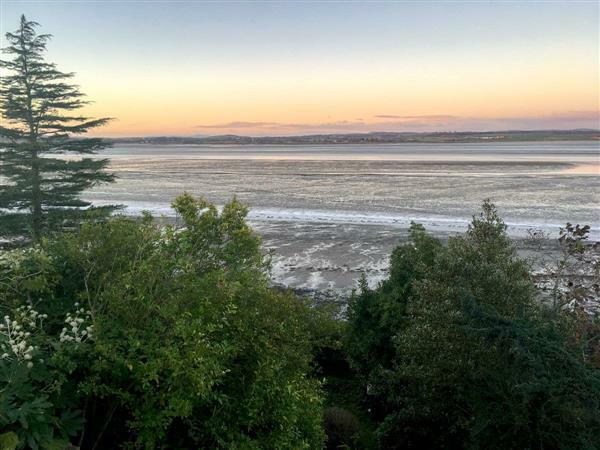 There are views over the Solway Estuary from the Juliet balcony of the first floor bedroom, and the bathroom, also on the first floor, has a spacious marble shower cubicle with a rainfall shower head. Bowness-on-Solway is famous for being the start (or end) of the Hadrian’s Wall Path National Trail, a long distance footpath with 84 miles of glorious walking that includes stunning coastlines, rugged moorland, rolling fields and the dynamic cities of Carlisle and Newcastle. The area is great for relaxing and also a fantastic spot for walking, cycling and birdwatching; there are several nature reserves nearby, including Campfield Marsh (RSPB). The Solway Estuary is accessible from a nice pathway leading to the beach. With so much to offer in the area, Bank Cottage truly is a little bit of luxury to return to after a day exploring this stunning coastline. You will find the beach on the doorstep at Bank Cottage near Wigton. With the shop 4½ miles, the pub (serving food) is 100 yards, and the restaurant is 10 miles from Bank Cottage. Living room: With multi-fuel burner, 43 Ultra HD Freeview Smart TV, Blu-ray player, beams, vaulted ceiling, beams, wooden floor and French doors leading to garden. Kitchen/dining room: With electric oven, 5-ring gas hob, microwave, fridge/freezer, dishwasher, washer/dryer and beams. Bedroom 1: With double bed, en-suite with shower cubicle, toilet and heated towel rail (also accessed from hallway) and French doors leading to terrace. Bedroom 2: With double bed, vaulted ceiling, beams and French doors leading to a Juliet balcony. LPG central heating, gas, electricity, bed linen, towels and Wi-Fi included. Initial fuel for multi-fuel burner included. Welcome pack. Enclosed lawned garden with patio, garden furniture, chiminea and barbecue. 2 small dogs welcome. On road parking. No smoking. Please note: Fenced estuary, 30 yards away. Holidays at Bank Cottage run from Saturday to Saturday. Pets allowed at Bank Cottage. For a better idea of where Bank Cottage is, you can see Bank Cottage on the map below. Bank Cottage is in Cumbria; should you be on the lookout for a special offer, you can find all the special offers in Cumbria. It's always worth checking to see what is on offer at the moment. Do you want to holiday near Bank Cottage (UKC2851), you can see other cottages within 25 miles of Bank Cottage; have a look to find your perfect holiday location.